"One of my family's favorites. They are made with bacon bits and seasonings and taste especially good when cooked on the grill." In a medium bowl, mix together the ground beef, onion, egg, bread crumbs, and bacon bits. Season with garlic salt. (I like to use a lot.) Divide into four balls, and pat into patties. Lightly oil the grate, and place patties onto the grill. Cook for about 5 minutes per side, or until firm and no longer pink in the center. Serve on toasted buns with your favorite hamburger toppings. These big beefy burgers have a savory bacon surprise in the center. Good meatloaf sandwich recipe. Next time I'll add catsup to it. I don't eat garlic, so left that out. I'll use freshly fried bacon for more bacon flavor. This recipe was alright; overall, it wasn't quite moist enough and the bacon was difficult to detect under the flavor of the onion. 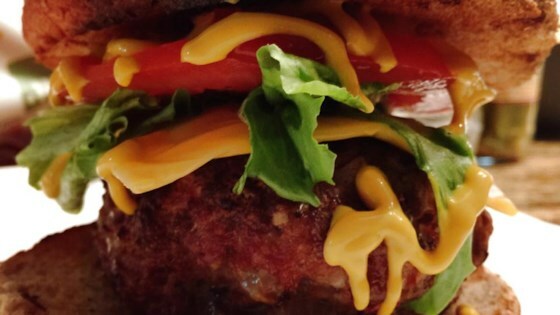 There are definitely better burger recipes out there. These were okay - probably won't make again - there are too many five star burger recipes. Excellent burgers. I made cheesburgers with swiss cheese melted on a toasted bun and it complimentd the burgers nicely. Sorry to say but these will not be added to our favorites list. Tasted too much like meatloaf on a bun for my family.